We all know that termites are very small. If you think that their small size makes them seem relatively unintimidating to other insects, then you would be right. 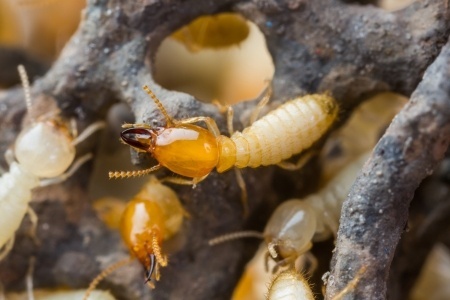 Termites are certainly not known for being effective predators. Even insects that are as small as ants often battle termites willingly. Not surprisingly, superior sized ants have no problem winning the battles they start with termites. Then again, termites can take clever measures to prevent enemy invasions. For example, termites will construct their nests to be fortresses. Termites can build their nests in a way that prevents enemies from invading. Although termites are not the best fighters, they can still be lethal to predators, but often at their own peril. In fact, some termites will explode when predatory insects are near, similar to suicide bombers. However, there is one particular organism that can successfully invade termite nests by posing as termite eggs. Which insect is capable of this feat? None actually, the invading organism in this case is a type of fungus. A study in Japan described the many different types of fungi that invade termite nests. The invading fungi feed on the small wood-chips that termites transport back to their nests. Termites never seem to learn that their food is being stolen by imposters since the invading fungi employ a clever disguise. These fungi will form into spherical shapes in order to appear as termite eggs. The shape-shifting fungi will form into the exact length, width and firmness of certain termite eggs. The fungi can even produce and emit a chemical called lysozyme. This lysozyme chemical is emitted by termite eggs as well. Obviously, the invading fungi can better fool termites by producing and emitting smells that remind termites of their own eggs. Due to all this trickery, termites have no way of discovering that their eggs are really a form of fungus. There are many different species of fungi found invading termite nests. Surprisingly multiple species of fungi can invade one particular nest at one time. The duped termites even take care of the fungal imposters by grooming them like they are their own eggs. Although you have probably never heard of this particular fungal phenomenon, Japan is not the only place where termites are fooled by these types of invading fungi. The United States is also home to these strange and devious happenings involving termites and fungi. Do you think that termites ever recognize the fungi for what it really is?